A1 Security were approached by SKDC in 2014 to provide a CCTV solution to protect Grantham Canal from fly tipping. 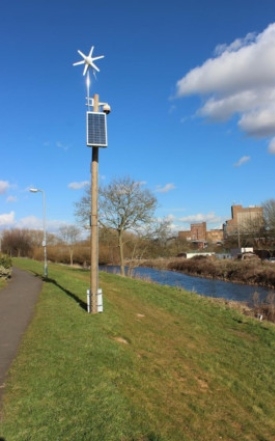 The challenge was that the cameras needed to be installed on towers along the Canal bank, where unfortunately mains power or communications were not possible. We investigated an ‘off the shelf’ solution but it became apparent that no such system existed. Not to be deterred, we set out to design and built our own system. The result was a HD CCTV camera, powered by battery and recharged by a solar panel and wind turbine, and using mobile networks live images are streamed back to the Councils offices. The overwhelming success of the system resulted in Fly Tipping stopping completely, and A1 Security being presented with a Business Innovation Award in April 2015. A1 Security were approached again by SKDC in 2015 to provide a CCTV solution to protect New Street from fly tipping. The challenge was that the cameras needed to be installed on street lighting posts where communications were not possible. The result was a HD CCTV camera, powered by the mains system in the street lighting, and using mobile networks live images are streamed back to the Councils offices.